Do-it-yourself chimney cleaning enables ambitious, capable, and well-equipped home handymen to save hundreds of dollars annually. Some homeowners are so drawn to the fireplace that they ignore the mess and hassle that accompany its operation and maintenance, not to mention its notorious energy inefficiency. What cannot be ignored, however, is creosote. It’s essential to understand this gummy, foul-smelling byproduct of combustion if you want to know how to clean a chimney. Creosote builds up gradually and can become a very real fire hazard. According to some estimates, dangerous accumulations of creosote contribute to about a quarter of house fires. 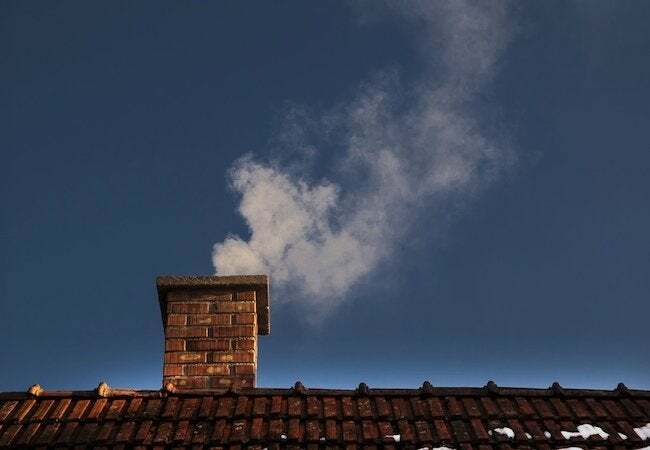 Though most people opt to hire certified specialists for the job, read on to find out how to clean a chimney yourself. If you have the right tools and are comfortable working on the roof, it’s easier than you think. Spread out a plastic tarp or painter’s drop cloth to protect the floor surrounding your fireplace. Next, proceed to remove ash and stray bits of wood from the firebox. Once it’s free of loose debris, go ahead and open the damper. At this point, it’s crucial to isolate the fireplace from the rest of your living room. Using thick plastic sheeting and quality tape, seal the front of the fireplace completely, without any gaps in the seal. Cut corners here, and later you may be left with fine dust coating all your furniture! When considering how to clean a chimney, many homeowners don’t consider protective gear at all. You will need a set of goggles that form a dependable seal around the eyes. If you try to make do with run-of-the-mill protective eyewear, you may be risking a trip to the doctor. In addition, you’ll need a quality dust mask, a few different types of chimney brushes, and a sturdy ladder that can get you on the roof. If you have no experience doing work on the roof, this isn’t the time to learn. Call a chimney sweep. Many of the most dangerous DIY projects take place on the roof; proceed with extreme caution! 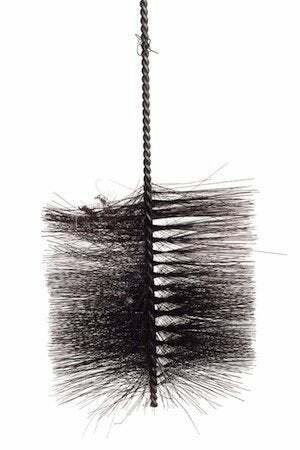 Remove any hardware obstructing the top of the chimney, be it a chimney cap or animal guard, then get down to business with the largest-diameter chimney brush in your arsenal. Brush from the top down, working your way toward the smoke shelf—the flat area located in the “crook” behind the damper. Take your time and do a thorough job. When you’re done sweeping the flue, replace the hardware you removed, ensuring that all fasteners are properly secured. Make your way safely down the ladder. Allow some time for the dust you’ve upset to settle into the firebox. After the waiting period has elapsed, peel apart a small opening in the taped seal you positioned over the firebox. Using a smaller-diameter chimney brush, reach through the opening and scrub as far up into the chimney as the brush can reach. When you’re finished, cover up the fireplace again, and let any additional dust fall onto the floor of the firebox. When you peel back the plastic sheeting, do so slowly and deliberately. Learning how to clean a chimney—and finishing the job yourself—means being careful once you’re back on solid ground. Stirring up soot would mean having to deal with a mess that’s even larger than the one already awaiting you. Another word to the wise: Be sure that no one opens any exterior doors, which would allow a sudden draft to send dust and ashes all over your living room carpet and furniture. The simple act of opening a door would defeat the purpose of having so painstakingly confined the dust and debris behind a plastic membrane. Move the sheeting carefully out of the way, then use a shop vacuum to clear the firebox. You may need to empty the vacuum midway through the job, depending on the machine’s capacity. Chances are you’re not eager to clean the chimney again anytime soon. Though creosote inevitably builds up over time, you can slow its accumulation by using only properly split and seasoned firewood. Also, steer clear of the slow, smoky, and smoldering fires that create creosote especially quickly. To avoid these sorts of fires, always provide adequate air to the fire. This practice encourages hot, clean-burning fires that generate the least creosote—in other words, the types of fires that will help keep you off the roof for as long as possible.